Walmart (WMT) has been busted for a bit of funny business in the bakery department after a shopper caught her local store slapping new stickers on an expired box of doughnuts. 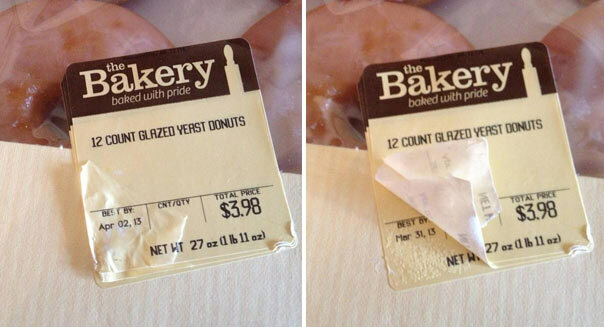 Reddit user Planet_Rock posted a series of pictures to the site showing that a box of glazed doughnuts that had hit its expiration date was simply slapped with a new sticker and kept on the shelf. Peeling back the stickers, she found that the sticker with the April 2 expiration date had been slapped on top of a previous sticker showing an April 1 date. And she found yet another sticker under that one, showing that the doughnuts had actually expired back on March 31. She didn't notice the sticker scheme until after her mother had returned home with the doughnuts, which she says were purchased at the Walmart in Lawrenceburg, Kentucky. "I ate one of the donuts, it was pretty bad," she adds. "Hard and stale." We reached out to Walmart for comment, but haven't heard back yet. If true, though, this is just the latest example of product-stocking issues plaguing the retail giant. Bloomberg reports that Walmart is having trouble keeping its shelves stocked due to understaffing, and hundreds of Walmart shoppers wrote in to the site to complain about bare shelves at their local Walmart. The doughnut affair suggests that Walmart is also dealing with the opposite problem: It's having a bit of difficulty getting some grocery items off the shelves in time. While that's a common issue for those in the grocery business, slapping a new sticker on an expired product isn't how most stores deal with it. UPDATED (12 p.m. ET Friday): Walmart responded to say that the company is investigating the incident. "We are taking this seriously and are looking into this further to find out what happened," the company wrote in an emailed statement. "We are committed to providing our customers with fresh, quality food every day. We have also reemphasized our food standards with this store and re-trained associates on the correct process for labeling food."